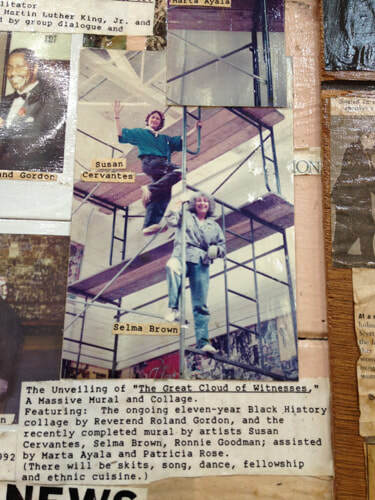 Preserving "The Great Cloud of Witnesses"
​WALLS OF GENERATIONS: At left, faded newspaper clip from 1992 of Precita Eyes artists Susan Cervantes and Selma Brown painting the mural that rings the top of The Great Cloud of Witnesses, inside the Ingleside Presbyterian Church. At right, Cervantes' son Suaro atop a scaffold 25 years later, preserving the giant collage. ​Panorama of The Great Cloud of Witnesses of the Gymnasium. ​Rev. Roland Gordon, pastor of the Ingleside Presbyterian Church and Community Center (1345 Ocean Ave.), calls it his "living wall and history lesson." The "Great Cloud of Witnesses" is a mural unlike any you've ever seen. Looking for a way to inspire community youth, Reverend G. pasted a single newspaper clipping of his hero, Muhammad Ali, to the wall of the church gymnasium in 1980. Over the past 37 years, the collage has expanded to cover, from top to bottom, the entire gym, fellowship hall, stairways, hallways, bathrooms, basement, and meeting rooms -- basically, everywhere but the sanctuary. The collage‐mural consists of newspaper and magazine clips, photos, flyers, posters, prints, poetry, painted murals, and a dizzying array of objects that celebrate heroes and history. Precita Eyes muralists Suaro Cervantes and Ernesto Paul spent several weeks recently working on "the cloud," cleaning, sealing, and resisting the temptation to read the wall-to-wall scrapbook as they were working on it. 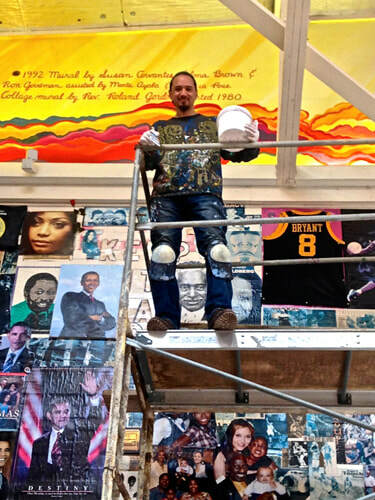 Ringing the top of the gymnasium wall is a sunset-colored fringe with the portraits of 10 civil rights leaders. This mural was created by an earlier Precita Eyes crew — Susan Cervantes, Selma Brown, Ronnie Goodman, Marta Ayala, and Patricia Rose. Suaro Cervantes remembers accompanying his mother Susan to the church, back in 1992.